I began the Cleveland Nutrition program along with my wife, Jill, for health reasons as well as for weight loss. I had been diagnosed with the autoimmune disease polymyalgia rheumatica (PMR) and had to take Prednisone, which I hate being on. I had read that a plant-based diet helps the immune system and autoimmune issues, so when she described the plan to me, I was on board from the start. In the past, my weight has gone up and down. I would experience periods of binge eating during which we would get ice cream, donuts, candy and other junk food. I’m a sugar addict, and the more I ate, the more I wanted. Prior to my diagnosis of PMR, I was in the throes of bingeing, and my weight ballooned up to a high of 252 pounds. I felt awful, especially when I began to take the Prednisone. I hurt all over and I was depressed and anxious. 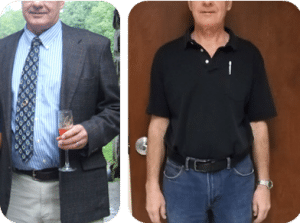 I had tried other diet programs that worked temporarily, but as soon as I approached my goal weight, I returned to my previous eating and went right back up again, sometimes even higher than previously. It seemed pretty easy to get on the program. My wife adapted to the cooking and prepared fresh food that made me full. I don’t remember too many cravings or going through a detox period, and I really liked that when I was hungry, I could eat. I helped her shop, and we learned the program together. I even tried my hand at cooking. Once in a while, I wanted some candy, but fear of the PMR coming back kept me from cheating, and I even got through Halloween without eating one candy bar. I’m not missing the meat since we substitute and don’t deprive ourselves of good, wholesome food. Because we enjoy going out to eat on weekends, it was a challenge at first to find restaurants that serve the food we need, and we found we had to find new favorites. We’ve discovered that many of the nicer restaurants will cater to us, so we’ve had fun looking for new places to explore together. Neither of us looks at this program as a diet. For us, it’s now a lifestyle, and instead of wanting something we used to like, we have found new favorites to replace past treats. Parties and gatherings are no longer a challenge since we bring a dish or two we can eat and share it. Our kids are now experimenting with plant-based food as well. I was ecstatic to watch the weight fall off. We began on June 20, and by December, I had lost almost 60 pounds. I feel great now, and as of this writing the PMR has not returned. I have lots of energy, my blood pressure is down to 110/75, and my blood work and other tests all come back normal. I’m ready to face my golden years without worrying about a diet-related disease disabling me. Thanks, Dr. Gutman!